Reverse scrolling, better known as ‘natural scrolling’ for OS X Lion users, is when the content on screen follows your finger movements, just like iOS. This is activated by default for vertical scrolling, but what about horizontal? Oddly enough, scrolling left and right maintains the old style scrolling behavior, moving the content away from your fingers instead, but with a free utility called Scroll Reverser we can change this. 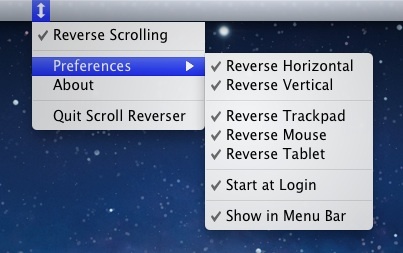 We’ve discussed Scroll Reverser in the past as a way to get natural scrolling in Mac OS X 10.6 but the app has since been updated to include more specific scroll customizations, including options to set custom scrolling behavior independently for trackpad, mouse, and a tablet screen, in addition to vertical scrolling and the aforementioned horizontal scrolling. The app works in Mac OS X 10.5, 10.6, and OS X 10.7, and later, and is a free download. What are you talking about? There is natural scrolling both vertically and horizontally in Lion. You dyslexic? It’s normal in Lion, but I like that you can set it for different things like Trackpad vs Mouse, because it feels awkward on a scroll wheel. What about scrolling by arrow key? In browsers and other apps where the arrow keys are used (at least sometimes) to just scroll the window contents rather than to move an insertion point or something, if you’re used to natural scrolling, it makes sense to have the up arrow move content upward and the down arrow move content downward. I have lion with natural scrolling turned on. With this tool it reverses everything (including the mouse) except Horizontal scrolling, where I prefere to keep the OSX natural scrolling. Thanks a lot! You are awesome! I like “natural” scrolling on trackpad, but I hate it on wheel mouse. Now I can set vertical and horizontal scrolling for different devices.